We’d love your help. Let us know what’s wrong with this preview of Micah-Malachi by Ralph L. Smith. A companion series to the Word Biblical Commentary, the Themes seek to distill the theological essence of the last seven biblical books of the Old Testament as interpreted in the more technical commentary series and to serve it up in ways that will enrich the preaching, teaching, worship, and discipleship of God's people. To ask other readers questions about Micah-Malachi, please sign up. Word biblical Commentary is generally a good resource for Bible study. I read the section for Micah in this volume in preparation for a class to be taught over a period of many weeks. This commentary is on a par with the Hermenia volume by Delbert Hillers. It is concise and to the point. The exegesis is conservative and includes discussion of other points of view. The bibliographic material makes this a very useful tool for one’s own study. This book ticks the box of giving a thematic overview of Micah—Malachi. It lacks the brilliance and brevity that runs through Douglas Stuart's Hosea-Jonah, but it ends better than it begins, and it has a concluding chapter that reflects on theological themes that run across the books considered (something that Stuart lacks). The major weakness is a tendency to rehash all of the matters of introduction for a given book instead of getting down to business with a book's treatment of theme. 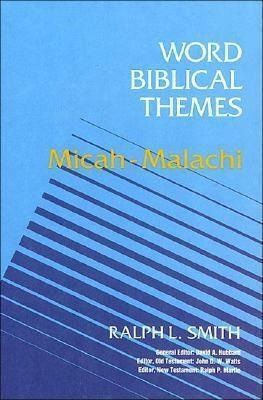 This woul This book ticks the box of giving a thematic overview of Micah—Malachi. It lacks the brilliance and brevity that runs through Douglas Stuart's Hosea-Jonah, but it ends better than it begins, and it has a concluding chapter that reflects on theological themes that run across the books considered (something that Stuart lacks). A good general introduction to these minor prophets, but very sparse comments on individual verses. Bibliography is best part of the book.